There have been many occasions lately where someone has asked me if I had a card. In the age of smart phones, do people still carry business cards? by professors to carry business cards. Several other friends said they always cards on their person. I sat down one morning this week, and worked out a little card for Pink Doxies. I was so prepared now! Then the thought hit me of how I was going to carry them. Believe it or not, a Baggie is not de rigueur. So, I came up with my own. their bag to grab a business card? And wouldn't it show their creativity nicely? and made more because now I knew I had lots of friends who carried cards. They all got a touch of fancy stitches. Customized to fit the need. I'd love to know what you think or if you have a suggestions. The slight wonkiness is because I have the last finishing stitches to do yet today. My WIP here. and give you that all-over-warm-and-fuzzy feeling? but were afraid they would think you were just full of yourself? and I didn't want to sound like I was tooting my own horn. we sure could use a 'little' good news today. In the end, I thought you'd enjoy it. One late night, not so long ago, I was sitting in this same chair surrounded by the Doxie Girls, and working on a blog post. 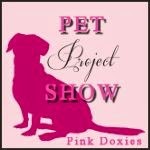 I was googling "Pink Doxies" to see what came up since I was adding tags to old posts. Pretty much normal links from what I'd seen before, but I clicked to the second page to find an entry from Kate Spain linked to Pink Doxies. Huh? Now, I love Kate Spain's fabric lines, you all know, especially the Daydream line with the alpacas/llamas. Whenever I'd use my fabric, I'd tag her name in the posts. The internet link I'd found went to Twitter on January 10 where Kate Spain tweeted to "Check out what Julie at Pink Doxies was doing with (my) orphan blocks." I had to ask my teenage daughter if that was 'really' from her, and it even shocked/impressed her. (Then she asked who Kate Spain was!) I said she was one of those Quilting/Fabric Rock Stars I admire. I walked around with my warm- fuzzy feeling for days after my 'AttaGirl. Then reality set in, and I quickly realized I needed to make some changes. Admittedly, I wasn't even on Twitter, and that was how I missed it from weeks before. I'm on Twitter now. Surprised? If you follow me anywhere, I'll follow you back. and saw a block from my Jelly Beans when I popped in. And then on Blossom Heart Quilts the same day. It was a thrill, and I am grateful to both kind bloggers. There was Happy Dancing in the Kitchen that night! I'm linking up with lots of parties today. A great inspiration for us all! Sarah, at Confessions of a Fabric Addict. The WHOOP WHOOP button is hers. Either way you link up, remember it's a party here, so schmooze with the crowd! Visit others who've linked up. Leave a comment so they know what you like about their work. The people to either side of your link would work, or their neighbors, too. Don't miss a post! Follow me on Bloglovin' or by email. The Linky Party starts now, and runs until Monday, February 2 at midnight. and Crafty Things to make. Glad you've had some warm fuzzies lately, and thank you for sharing them with everyone. It's okay to be acknowledged and share that you did! Love your new business cards and the cases. What are you closing the larger ones with - the velcro? So glad I got to feel/touch one of these cute business card holders. Too bad I wasn't into the quilty stuff all the years I managed the book store! But I love them - so much nicer than the stiff leather folded ones!! Keep up your lovely work. Your new card holders are wonderful., and congrats on the shout out from Kate Spain. Very, very cool. These are the cutest! And, your workmanship is superb. I love the way you embellished them with the different stitching and then added the little tag. Very nice. Happy Friday. I use the Velcro One-Wrap, and I love it. Normal Velcro will snag polyester, and picks up every string and bit of lint. This type does none of that, and stays new looking forever. It runs about $3.50 a yard at the local JoAnn's. Another perk is there is not gumminess to deal with while sewing it on. The front and back are on the same strip. Love the card holders - so cute with their different stitching and fabrics. Do you have a pattern? And thanks for the heads up about the different velcro. I'll add that to my Jo-Ann's list. Thanks for sharing! Kram från Sverige och Bambi!! Whoop whoop! You're firing on all cylinders these days!! Love the business cards AND the holders, and congrats on all the warm fuzzies! Hi Julie, just popped over to say hello and I'm bowled over by your colourful work. What a great idea the card bags are, a good way to use up small scraps of fabric. I've been given a bag full of samples by my fashion designer friend and now I know what to do with them! Thanks for your kind comments on my blog too, hope to see you there again soon.